Heel pain can cause problems for many keen runners. Jan, a 51-year-old keen amateur runner, came to see me about persistent heel pain. 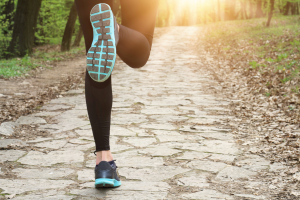 Although she had not had a definite diagnosis, the location and nature of the pain appeared to match what one would expect with plantar fasciitis. This is inflammation of the plantar fascia, a strong band of tissue (like a ligament) which stretches from the heel to the middle foot bones. It supports the arch of the foot and also acts as a shock-absorber. Her heel had been ‘niggly’ for the previous year, but in the past 4 months, it had steadily become worse. Jan only gave the pain 5 out of 10, so she wasn’t in agony, but it was hindering her running. She had been given exercises for her heel but she wasn’t getting the results she wanted. Jan had started doing more swimming and cycling instead but was frustrated because running was the form of exercise she most enjoyed. For her first treatment I felt up the mid-line of her calf and just under the back of the knee, I found a small lump which was tender. I used Gua sha (a scraping therapy which brings impurities to the surface) and a small purple patch appeared where the lump was. As soon as this patch appeared the area was less tender. I then put acupuncture needles under her heel and attached electrodes to them and gave her electro-acupuncture treatment. By the third treatment, Jan was happy that the pain was improving, with it being less intense and less frequent. By the 6th treatment she reported that her heel was great, ‘no problem at all’ and she had taken up running as her main sport again. She has had no problems since. If you are experiencing an ongoing injury which is not responding to usual treatments, call Jackie Graham and give acupuncture a try. You can also see Jackie at the Bridge to Health clinic in West Ealing.